It was again an accomplishment not only for Mommy but for Meg, too. 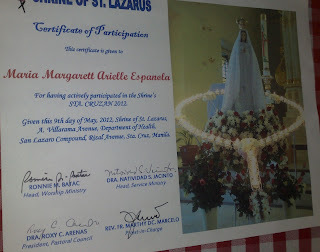 After the procession, Certificates of Participation were given to them. I was a bit worried since I was not seated beside her and I didn't know if she understood the giving of the certificates. A nervous mom again, as the priest called her name, I immediately stand up and then I saw her walking towards the altar. Yay! I think I underestimated her. I was again proud and happy. Santacruzan is not just a showcase of beauties, but as you walk during the procession, prayer intentions were recited. And then again, the value of sacrifice, simplicity, and the virtues that the Blessed Virgin Mary imparted to us should be respected and valued. 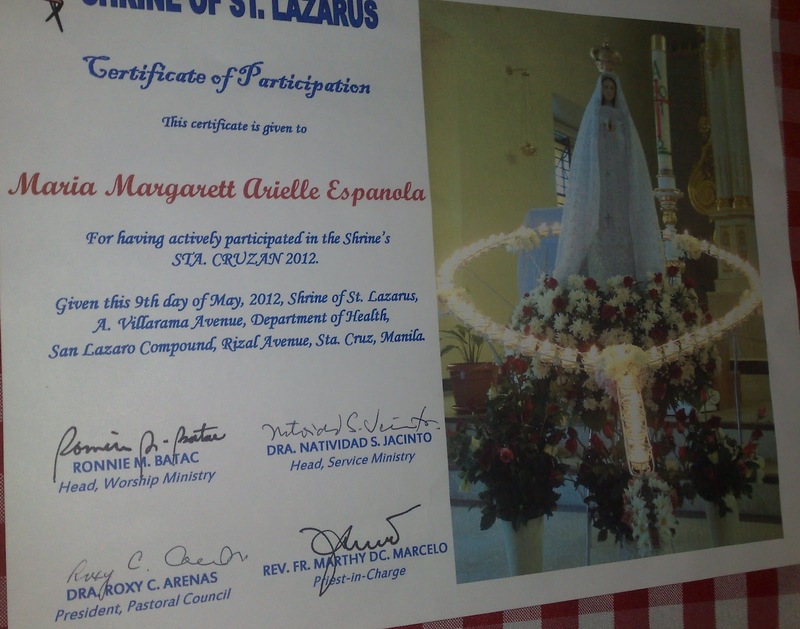 bigla ko naalala childhood ko, i used to join santacruzan too!..nice to see your angelic daughter! visiting from MM, hope you can take a peek at a person fit to be called a "Mother"
They are all very pretty, manang mana sa Mommy! Our Moments, have a great Mother's day Celebration! Very pretty girls! Happy Mother's Day! Visiting for MM! thanks =) Happy mother's day mommies! awww! that is a sweet moment with the Reyna :-) miss santacruzan back in the Philippines :-) I love the pictures too...so cute :-) Dropping by from Mommy Moments. sweet moment! :D visiting from Mommy Moments! :D thanks for joining us! La Familia Pesina: Swimming is always FUN!